Located south of the Indian Ocean, Mauritius is known for honeymoon travel or as a sun and beach destination. Its white sand, bathed by turquoise waters, and its interior covered with thick vegetation has been, for years, one of the main tourist attractions of the country. However, a vacation package to Mauritius is much more than that. Its capital, Port Louis, is a coastal city full of life and with a great cultural offer. Thanks to its museums such as the Natural History Museum or Blue Penny, where the traveler can learn of the origins of this island in which, recently, an ancient continent has been discovered under its waters. The life of the locals can be found in its multiple markets, where you can taste the delicacies of the country and buy the native products of Mauritius. 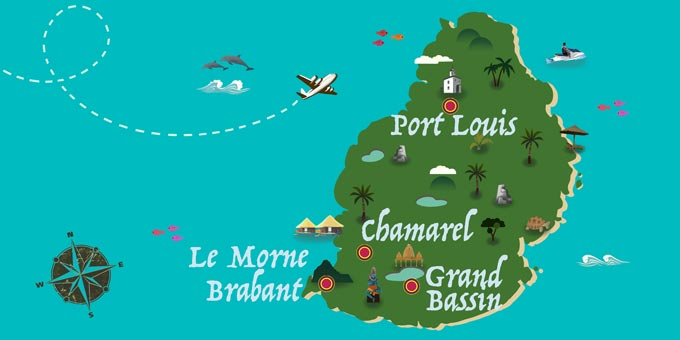 It's untouched natural wonders are another of its great attractions: the Grand Bassin, its great volcanic lake; Le Morne Brabant, a huge basaltic rock; or the Land of the seven colors and the waterfall of Chamarel, are just some of the jewels that the country boasts. Passport with a minimum of six months validity and a return ticket. No advance visa is required. 230 V. No adapter required. If Mauritius has caught your attention, leave us your number so we can call you to discuss the voyage that awaits you.